Release of the "TMAX 10th Anniversary WHITEMAX" Limited Edition Celebrating the 10th Year of the “Automatic Supersport" | Yamaha Motor Co., Ltd.
Release of the "TMAX 10th Anniversary WHITEMAX" Limited Edition Celebrating the 10th Year of the “Automatic Supersport"
Yamaha Motor Co., Ltd. announces the release of the "TMAX 10th Anniversary WHITEMAX," a special edition of the automatic-transmission supersport model XP500 TMAX powered by a 500cc liquid-cooled, 4-stroke, DOHC, parallel twin, 4-valve, fuel-injected engine. This model will be sold from November 10, 2009 with a limited order period. Orders will be accepted from November 1, 2009 to June 30, 2010. The TMAX 10th Anniversary WHITEMAX takes the standard TMAX as its base and adds (1) water transfer 3D printed carbon pattern parts around the cockpit and other parts of the model, (2) wheels with two-tone coloring, (3) a two-tone seat with a sharp and sporty look and (4) a special 10th Anniversary emblem along with special white color scheme and other detail appointments to heighten pride of ownership. The original XP500 TMAX model was released in Europe in 2000 and Japan in 2001. The combination of a 2-cylinder engine with reciprocating piston balancer and CVT transmission and a well balanced body provides a high level of sports performance to the ride that won this model a strong following as an automatic-transmission supersport model. The model continued to mature with the adoption of fuel injection, radial tires and a front double-disc brake, etc., in 2004. A model change in 2008 brought a new exterior design and new frame made by Yamaha Motor's exclusive "CF Aluminum Die Casting" technology. 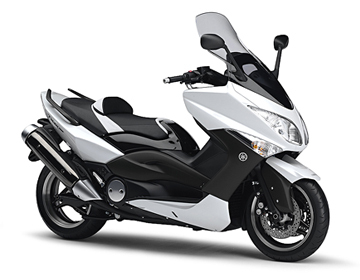 The new limited-edition WHITEMAX adds the above-mentioned features to further accentuate the "comfort and sportiness" of TMAX.